Imagine you were a cow. A meat cow. Now ruminate 😉 on what is the one moment in time that led to billions of your species being butchered and eaten every year. According to the legend, that moment came sometime in 1895 when Louis Lunch served the first hamburger sandwich. 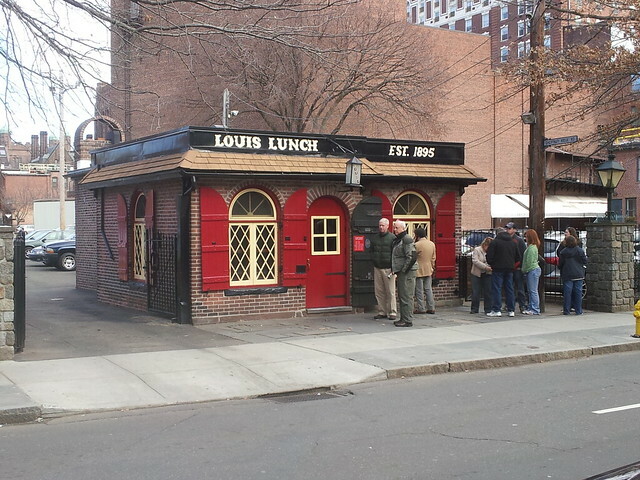 Louis Lunch, established in 1895 in New Haven, Connecticut, claims to have invented the hamburger sandwich. Perhaps ironically, Louis did not invent Lunch (but if he did, they’re passing up on perhaps a more impressive claim to fame). They serve their hamburger sandwich today the same way they did over a century ago: a ground beef patty on toasted bread (not a bun) with NO KETCHUP (caps added for emphasis). They also have Foxon Park Soda — a local favorite. Outside, you’ll wait online to get in. Inside, you’ll quickly learn that there are no buns or ketchup, and you’ll place your order. You’ll find a spot along the tiny, tightly packed hallway-like rooms — hopefully not around the corner by the restrooms where you won’t be able to hear your order announced. You’ll likely see tourists from places like Japan and Germany; you’ll think “perhaps I’ll try to start a conversation with them”; and then you’ll think “why take the chance”. The kitchen area is tightly packed with the machines that toast bread, and these archaic mechanical meat searing devices that make the patties. The interior, as insinuated before, is microscopically small, and features brick walls and 18th-century wood furnishings (like most of New Haven). It is a unique experience — even if you’re just getting a Foxon Park soda. If you love eating cattle, this is your Mecca. Last visited: March of 2012.